Naghi was born in the small town of Urmia in Iran (Persia). Growing up in that beautiful community and so close to Europe, he was always fascinated by the foreign languages and different cultures. Early 1977, as a medical student he was involved in a countrywide student demonstration against Shah (King of Iran) and his regime, which resulted in massacre of thousands of students and closing all the colleges and universities. Later that year Naghi escaped the country and after 40 days of treacherous journey through Turkey, Egypt and Europe, he finally arrived at his dreamland USA. Naghi has traveled extensively throughout the USA and has attended many universities, restlessly looking for a place to call home and finally Lord directed him to Sunny St. George in Southern Utah. 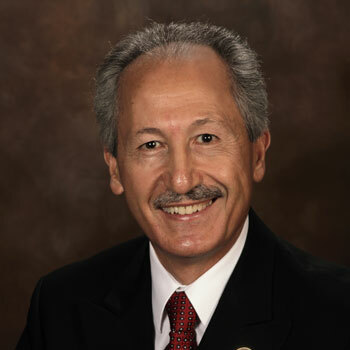 Naghi has served in many callings in his LDS Church. He translates and interprets General Conference talks to his native language of Farsi (Persian) during the Conference and has translated other church books and manuals. To hasten the work of salvation, he uses Skype and internet to teach missionary discussions with Full Time Missionaries around the world and so far he has brought many souls to the waters of the baptism. He and his wife are currently serving in the Utah South Area Public Affairs Council. He has served as Chairman of the Washing County Republican Party for four terms, has been the Dean of Leadership Dixie, Dean of Leadership Academy, and Volunteered for the Huntsman World Senior Games for 22 years. He has served on the board of the Children’s Justice Center, Chamber Sunshiners, Community Action Committee, and American Indian Services, Reagan Forum and the Dixie Junior Livestock show and Dixie State College Scholarship Associates. He is also the past President of the Rohnert Park, California Kiwanis Club. Naghi is a graduate of University of Texas at Arlington with a Masters degree in Structural Engineering. He is the Owner/Broker of Realty Express in St. George, a full service real estate and development company serving Southern Utah. He has served as the Governmental Affairs Chairman, Treasurer, Vice-President and President of the Washington County Board of Realtors, Utah Association of Realtors Election Committee, UAR Board of Trustees, Past President of the Leadership UAR (Utah Association of Realtors), and the National Association of Realtors. On April 1, 2013 Utah Governor Gary Herbert with the confirmation of the Utah State Senate appointed Naghi Zeenati as the new Commissioner of the Utah Department of Transportation to oversee the priorities and funding levels of state transportation projects, additions or deletions to state highways, and to advise UDOT on transportation systems policy and safety among other duties. On December 2014, he was also appointed to serve on the Permanent Community Impact Fund Board. CIB provides grants and/or loans to subdivisions of the state, which are or may be socially or economically impacted, directly or indirectly, by mineral resource development on federal lands. Naghi is married to Louise (Tweet) Gardner and together they enjoy serving the Lord and the wonderful people of the great State of Utah.